The management of business processes has recently received a lot of attention. One of the most interesting problems is the description of a process model in a language that allows the checking of the compliance of a process execution (or trace) to the model. 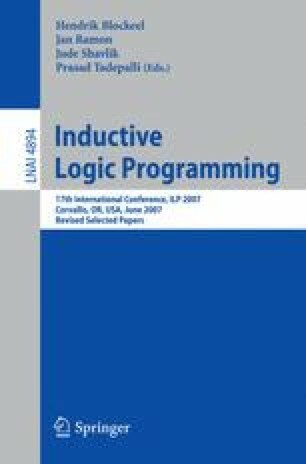 In this paper we propose a language for the representation of process models that is inspired to the SCIFF language and is an extension of clausal logic. A process model is represented in the language as a set of integrity constraints that allow conjunctive formulas as disjuncts in the head. We present an approach for inducing these models from data: we define a subsumption relation for the integrity constraints, we define a refinement operator and we adapt the algorithm ICL to the problem of learning such formulas. The system has been applied to the problem of inducing the model of a sealed bid auction and of the NetBill protocol. The data used for learning and testing were randomly generated from correct models of the processes.